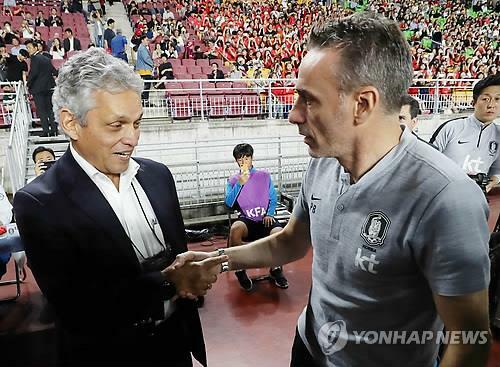 SUWON, South Korea, Sept. 11 (Yonhap) — Chile football coach Reinaldo Rueda said Tuesday that his tactic to deny South Korea’s buildup strategy worked well even though his side failed to get a win. Chile, ranked 12th in the latest FIFA rankings, were held by 57th ranked South Korea to a 0-0 draw at Suwon World Cup Stadium in Suwon, south of Seoul. Chile created promising chances throughout the match with their high-pressing game, but failed to hit the net. Diego Valdes could have become the hero for the visitors in second-half stoppage time, but his attempt flew over the empty net. Rueda’s side arrived in South Korea without playing a friendly match with Japan on Friday. The friendly in Japan was canceled due to an earthquake in Hokkaido. Chile saw their star player Arturo Vidal proving his reputation as one of the top class midfielders in the world. With his work rate, the FC Barcelona man was a consistent threat to South Koreans until he was substituted in the 72nd minute.